When Tom Petty began his rise to fame, many people wrote him off as just another pale imitation of either Bob Dylan, The Byrds or Bruce Springsteen. Twenty-five years into a career that has defied expectations, Petty is now in a position most artists would kill for: His catalog is like classic rock's Fort Knox, a deep cache of hits and classics. But Petty's perennial popularity also poses the same problem faced by many of his peers. If he plays just the songs his fans want to hear, he'll be accused of courting nostalgia. If he peppers his sets with too many new songs at the exclusion of some old nuggets, he's bound to disappoint the people that put bread on his table. Petty had a couple of factors working in his favor at the Tweeter Center Friday night. First, the mild reception to his last studio album, 1999's "Echo," made the decision to avoid newer tracks (save the fine "Billy The Kid") a no-brainer. Second, Petty has amassed so many hits and beloved album tracks that even a "greatest hits" set did not preclude variety. I like four things in life. Baseball, girls, summer and music. So for the sake of combining things I like, let me fill you in on my favorite summer albums. Look in the next issue for my favorite baseball girls. Tom Petty has always written the most infectious pop songs, finely crafted on a fine line balanced between heart and soul. No matter what, you can be certain that Tom will deliver a fine summer album perfect for passing the time in the heat. Without the help of his friends who were busy breaking hearts, he dished out a perfect album on every scale, especially the one of summer proportions. It all starts with a refreshing start, the title track 'Wildflowers,' bringing the album into a state of sincere simplicity, necessary on any Tom Petty release. With summer anthems like "You Don't Know How It Feels," "It's Good To Be King" or the gritty heat accompanied "Honey Bee," this album is an essential piece of any summer collection. Roving exhibit chronicles links to popular music. Florida offers more than sunshine and beaches. It's a hotbed for creative musicians, past and present. Lynyrd Skynyrd, a hard-rocking band from Jacksonville, took its name from a high school gym teacher, Leonard Skinner, infamous for his discipline of longhaired students. Gloria Estefan was already a hit in Central and South America when she and the Miami Sound Machine hit the charts with "Conga" in the mid-'80s. Jim Morrison - during a 1969 Doors concert at Dinner Key Auditorium (now Coconut Grove Exhibition Center) -- was accused of going oh-so-public with his most private part. Indecent exposure, said a judge, hitting him with a little jail time. The wannabe poet's eloquent reaction: "Jail -- that's a bad place." Tom Petty's uncle, working as an assistant prop man for the 1961 Elvis Presley movie "Follow that Dream," being filmed in Ocala, took Tom to see Elvis in action. And young Tom was hooked. As the story is told, one of his next acquisitions was a guitar. It's only rock 'n' roll, but you like it. So much, in fact, that you hang on to anything that ever got near a rock legend. Stevie Nicks is back with help from two well-known friends. Should Tom Petty ever hang up his rock 'n' roll shoes, he may have another career as a motivational speaker. It was Petty who pulled the mercurial singer-songwriter out of despair about seven years ago after she emerged from a program to get off prescription antidepressants. "I had expected to come out of rehab and start writing immediately," says Nicks, a month into a tour that includes stops Saturday at Verizon Wireless Amphitheater in Irvine and Tuesday and Wednesday at the Universal Amphitheatre. "If you're in a good humor and you're feeling good, writing is pretty easy," she says. "But my humor was gone. When you've been living in a bowl of depression, you have to come back up to feel good enough to put a song down again." 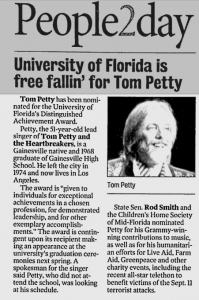 Tom Petty has been nominated for the University of Florida's Distinguished Achievement Award. 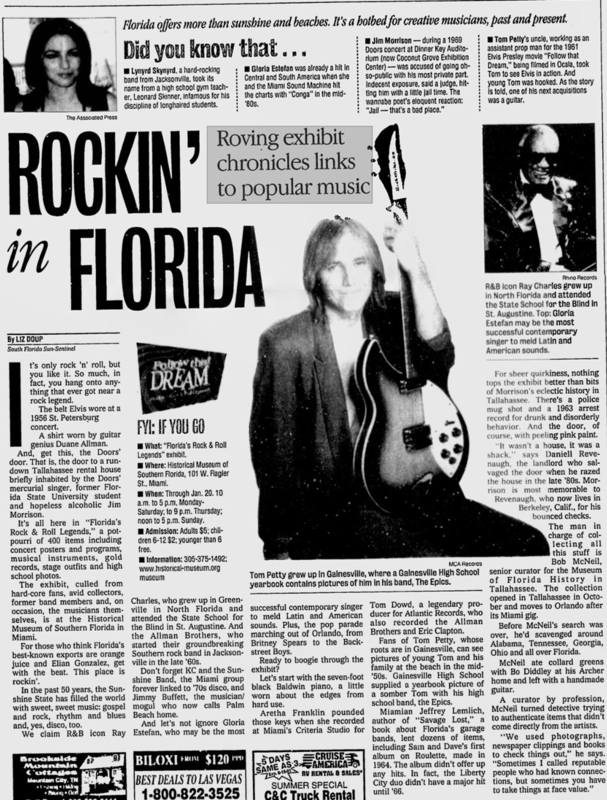 Petty, the 51-year-old lead singer of Tom Petty and the Heartbreakers, is a Gainesville native and 1968 graduate of Gainesville High School. He left the city in 1974 and now lives in Los Angeles. The award is "given to individuals for exceptional achievements in a chosen profession, for demonstrated leadership, and for other exemplary accomplishments." The award is contingent upon its recipient making an appearance at the university's graduation ceremonies next spring. 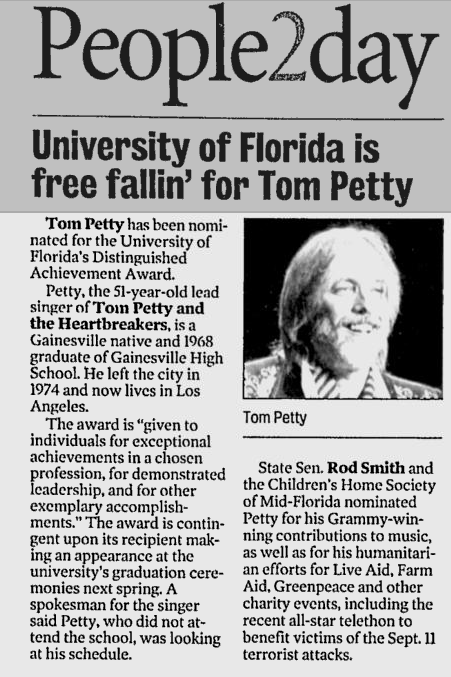 A spokesman for the singer said Petty, who did not attend the school, was looking at his schedule. State Sen. Rod Smith and the Children's Home Society of Mid-Florida nominated Petty for his Grammy-winning contributions to music, as well as for his humanitarian efforts for Live Aid, Farm Aid, Greenpeace and other charity events, including the recent all-star telethon to benefit victims of the Sept. 11 terrorist attacks. Tom Petty has never given in to trends. It's clearly paid off, as he gets set to join the Rock and Roll Hall of Fame. Tom Petty's music has always reflected the purity and faith of a musician who had the courage and conviction to simply listen to his heart. Rather than tailor his style to better fit critical or commercial trends, the singer-songwriter and his band the Heartbreakers have remained true, in themes and presentation, to the basic rock 'n' roll tradition that they learned from the records of such classic figures as Elvis Presley, the Beatles, the Rolling Stones, the Byrds and Bob Dylan. On Monday in New York City, Petty and the Heartbreakers will join those and other early heroes as members of the Rock and Roll Hall of Fame. Jakob Dylan will induct them in a ceremony whose taped highlights will be broadcast at 9 p.m. Wednesday by VH1. Other inductees this year include Isaac Hayes, Brenda Lee, Gene Pitney, the Ramones and Talking Heads. "I feel like a lucky man," Petty, 51, said this week at his home in Malibu, where he lives with his second wife, Dana, and her 9-year-old son from her first marriage. "A lot of people really struggle to find out what they want to do in life, but I knew as soon as I saw Elvis Presley, when I was 11. From that point, music became my religion, my nourishment. NEW YORK - They represented the anti-establishment, so it was a bit odd to see the Ramones so happy to become part of the music establishment as members of the Rock and Roll Hall of Fame. But for the remaining members of the punk rock originators - whose lead singer, Joey Ramone, died last year - Monday night's induction at the Waldorf-Astoria Hotel represented long-overdue respect for the band that helped revolutionize rock with their rapid-fire, guitar-heavy songs. "I'd like to congratulate myself, and thank myself, and give myself a big pat on the back," joked Dee Dee Ramone. "Thank you Dee Dee, you're very wonderful." The Ramones were inducted along with another of punk's first generation, the Talking Heads. Also inducted were Tom Petty and the Heartbreakers, former teen idol Brenda Lee, soul maestro and "Shaft" score creator Isaac Hayes, and hitmaker Gene Pitney. Rock star Tom Petty has purchased a home in Malibu for close to its asking price of $2.5 million. The house, on a sandy beach, has three bedrooms, two of which face the ocean. Built in 1974, the house also has three bathrooms, three fireplaces, Malibu tiles, an open floor plan and a courtyard with a fountain. Petty's band, Tom Petty and the Heartbreakers, has been together for nearly 30 years and sold more than 30 million albums. The foundation of the band's music has been classic rock, blues and soul of the '50s and '60s. 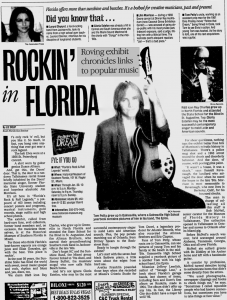 Tom Petty and the Heartbreakers--known for such songs as "American Girl," "Free Fallin'" and "Don't Back Down," as well as songs from the group's 1999 album "Echo"--will be inducted into the Rock and Roll Hall of Fame on Monday. Petty, a guitarist and vocalist, also won a 1989 Grammy for a performance with the Traveling Wilburys. Petty, 51, was married last July at another home he owns in Malibu. Another rock 'n' roller, Little Richard, performed the ceremony. A lot of people will hear Tom Petty's upcoming album, "The Last DJ," as an indictment of the music business. The title song, for example, decries the centralization and depersonalization of radio programming. "Money Becomes King" is the narrative of a disheartened fan who watches a rock hero's values and art get lost in a sea of commercialism, to a point where the fan feels that "all the music gave me was a craving for lite beer." Petty, however, advises fans not to take things too literally. "It's not about the music business," he says of the album, due in October. "That's familiar turf for me, so it works as a good metaphor. The music business is too easy a target to make it the enemy. Probably the biggest focal point of the things I'm talking about is the audience. What I find interesting these days is what the audience is willing to accept. I often wonder if they even care. I don't want to believe that....But there's a huge celebration of mediocrity in our culture, and I don't remember it to this extent before."